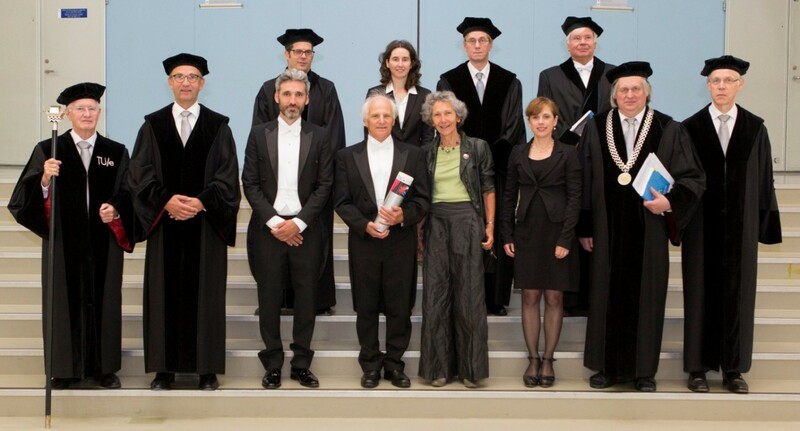 On the 16th of June 2016 Frans van Gassel defended his PhD dissertation “Handstorm principles for creative and collaborative working” at the Eindhoven University of Technology in The Netherlands. Creative leadership is necessary for new developments. Creative leadership skills enable professionals to conduct creative collaboration between designers, specialists and users to devise ideas and new designs to solve the problems of the principals and society. To support the design manager during these creative processes, the author has developed a set of design principles. The Handstorm principles help design managers plan, organize and conduct face-to-face design meetings. According to the design science research approach, the Handstorm principles have been validated by a creativity facilitation course that was developed based on these principles, which was successfully implemented six times in practice. As the name Handstorm suggests, these principles not only involve the use of both the left and right sides of the brain, but also the use of the rest of the body, employing one’s hands, taste buds, gestures, feelings, voice, and more. Designs are typically made with the help of artifacts, images, photos, language, analogies, stories, boundary objects, natural materials, writing implements, paper, and so forth. Handstorming (working with materials, tools, constructions and machines) can be considered as an enrichment of brainstorming, which is a more cognitive and intellectual process. This dissertation presents design principles that help professionals stay flexible and resilient when dealing with recent developments in the architecture, engineering and construction sector. These developments are increased mechanization and automation of the workforce on the construction site, increasingly performance-oriented tenders with a stronger focus on identifying the needs and values of both the client and the user, and the increasing number of design, build, finance, maintain and operate (DBFMO) contracts. Van Gassel, F.J.M. (2016). Handstorm principles for creative and collaborative working. (Doctoral degree PhD Dissertation), University of Technology Eindhoven, TU/e, The Netherlands, Eindhoven. De Nederlandse PowerPoint presentatie die tijdens de PhD verdediging op 16 juni 2016 in Eindhoven werd gehouden. Frans van Gassel is a retired assistent professor at Department Built Environment at Eindhoven University of Technology in The Netherlands.